Getting burnt out on paying a visit to the same sweet-tooth remedy again and again? We’ve got you covered with three of the latest and greatest bakeries to pop up across the Queen City. This Over-the-Rhine storefront is just what we always hoped for from Blair Fornshell. After five years of Brown Bear Bakery pop-ups at markets around the city—where her tables of treats were frequently reduced to crumbs well before the end of the day—the preternaturally talented baker opened her own brick-and-mortar shop in 2017. And that pretty little corner of 13th and Clay has never been better. Fornshell’s cakes are lovely, her cinnamon rolls are the best in the biz, and she’s a pro at using elevated ingredients like candied coffee beans, bee pollen, fruit compote, tea (Earl Grey and masala chai), and even edible flowers. Thanks to her refined take on baking, Fornshell’s creations are almost too beautiful to eat. But we think you’ll manage. Allez is all about the sourdough. The small Main Street bakery, named in honor of owner Tom McKenna’s cycling enthusiasm (allez! ), offers some half-dozen varieties, plus pastries, big ol’ biscuits, and a lunchtime menu of sandwiches (pastrami Reuben, chicken salad, et al.) on house slices, naturally. Above all, the sunflower seed-cherry sourdough is unforgettable: Crusty and textured on the outside, spongy and tangy on the inside, with a salty-sweet shell of seeds and fruit. Allez opened in spring 2017 just down the street from the decades-old Over-the-Rhine bread smith Shadeau, which closed shop last summer. Stop in for a loaf or a textbook-perfect baguette—a perfect plus one for your next dinner party invitation. When The Cake Rack left Findlay Market after 11 years at the same address (they’d existed since 1992), Over-the-Rhine lost its only full-service bakery, where you could walk in to order a cake and walk out with a freshly-made muffin. 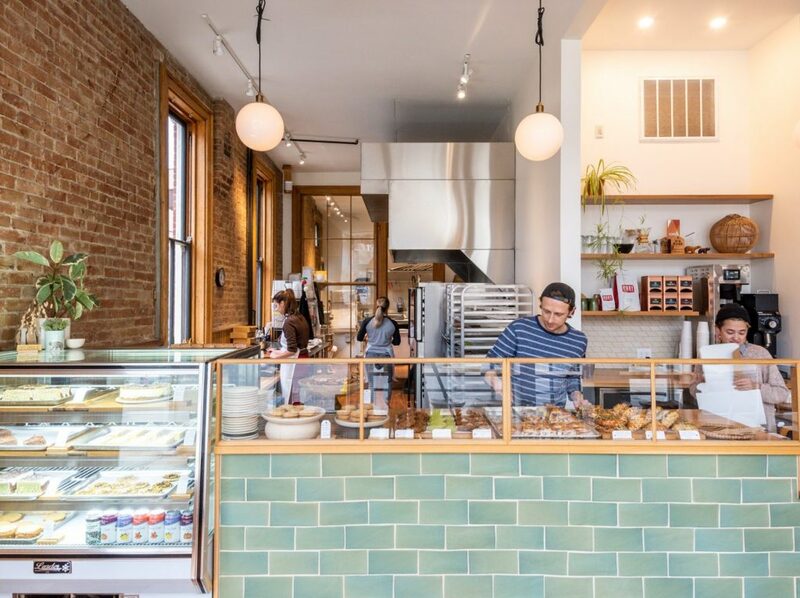 Then last year, Dave Hart and Dustin Miller of Collective Espresso, along with chief baker Faris “Ray” Moore, transformed the expansive market-facing Elder Street storefront into Mainwood Pastry. This was in part to carry on the Cake Rack tradition and also to formalize Moore’s pastry program, which you may recognize from Collective and other counters around the city. Look for scones, cookies, and perfect croissants, along with more advanced offerings like wedding cakes.